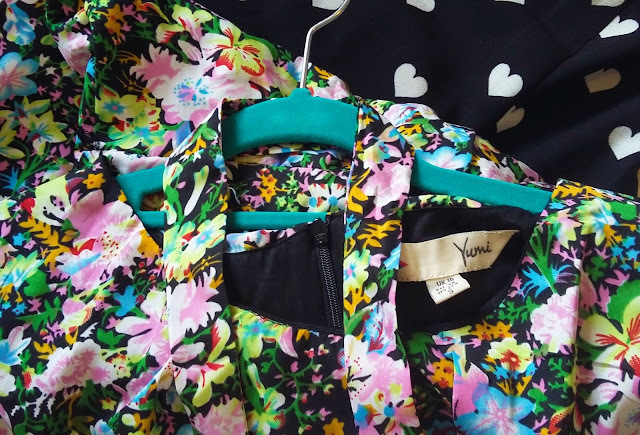 i've talked about my love of boutique brand yumi before, and i am certainly no stranger to their website; recently i discovered that not only are yumi stocked in many of my favourite high street shops, they're also stocked - well stocked, at house of fraser, the department store to the stars (and by stars, i mean me). as one of the biggest stockists of the brand's range of pretty skater dresses, i am now obsessed with checking the site daily for their infamous store-wide reductions, waiting for that all important discount to be applied to my overflowing basket, ready for check out. 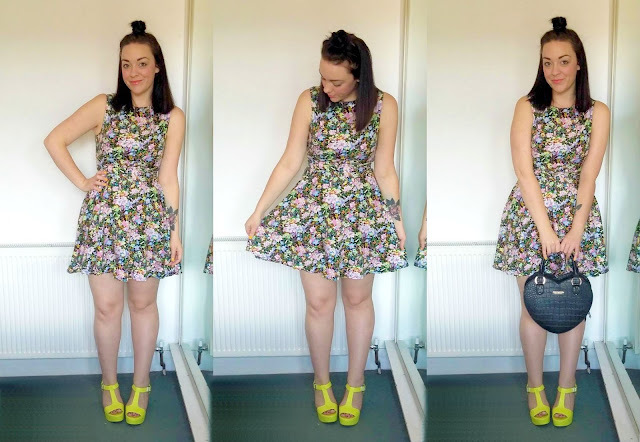 i have a permanently-full basket, mainly because of my permanently-broke status, so when i was sent this floral frock for review late last month, i was over the moon. 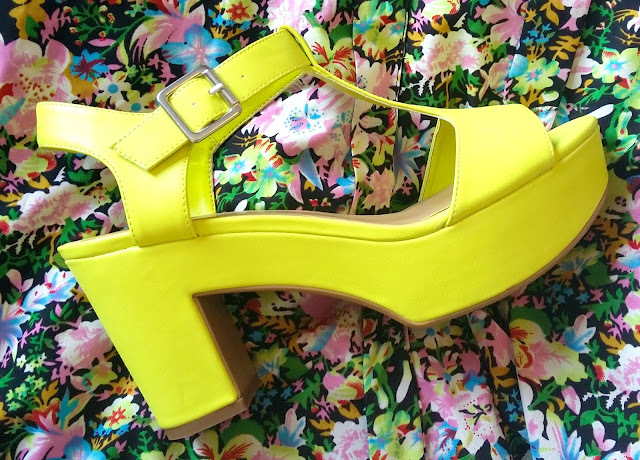 it's one that had been on my wishlist for a while, and not least of all because since i picked up these neon platforms, i knew i had an incredible outfit planned around it in mind. it's just a shame the dress is ~so short; there's no way i'd feel comfortable wearing it without tights, like, ever, and i don't really rate the idea of leggings and open-toed shoes. it's not a look i think i can pull off. it's a pity for sure, as i absolutely luhhhhve the colour combination of the dress' print and the bright shoes, but i'm sure i can replicate with a brighter bag and tights-covered legs instead. for what it's worth, and despite the length, the dress is terrific quality - a standard for yumi. the dress is fully lined and has a sturdy zip so there's never any fear of something bursting or flashing anyone on the street, and i can't wait to start wearing this more now that summer seems to be... gone. in other news, i'm not sure of my hair-do. it kinda resembles a pineapple.